There's nothing quite like a Crazy Upset Week in the NFL! The Browns, Bills, and Lions won, the Patriots, Vikings, Jaguars, and Packers lost, and no one knows anything! It was a wacky and wild fantasy week too. Let's take a peek at Week 3 studs and duds. The best fantasy QBs of the day played each other in an overtime showdown. Matt Ryan had 374 yards and 5 TDs but he was bested by Drew Brees. Brees had almost 400 yards and added 5 TDs of his own, including two on the ground. Brees wasn't the only quarterback with a pair of rushing touchdowns. Bills rookie Josh Allen was a breakout star in a shock win over Minnesota, and Cam Newton had two scores by air and two by land. Patrick Mahomes and Jared Goff both threw for 3 TDs and over 300 yards. Tom Brady was the day's huge bust. He was the #1 QB of the day in many rankings but was a complete miss with just 133 yards and one TD. Andrew Luck was another miss, with only 164 yards and a TD plus an embarrassing bench on the game's final Hail Mary play. Jimmy Garoppolo was a bust too a busted knee, it seems. Get well soon, Jimmy G.
Carlos Hyde started out the week with a bang, going for over 100 combined yard and a pair of TDs as he led the Browns to their first win in 635 days on his birthday, then rushed off to the hospital for the birth of his child. Adrian Peterson had another big game against the Packers with 120 rushing yards and a pair of scores. Chris Carson was a workhorse for the Seahawks with 32 carries for over a hundred yards and a TD, and Kerryon Johnson became the Lions first 100-yard rusher in 71 games. Todd Gurley, Alvin Kamara, and Christian McCaffrey kept the good times rolling with their usual stud performances, too. Latavius Murray could not have been more of a bust. He went from hot waiver start of the week to just 2 carries for 1 yard in a blowout loss. Kenyan Drake was a monster dud too, despite the Dolphins going to 3-0. He had just 7 touches for 10 yards. Undrafted rookie Philip Lindsay finally saw his dream run end with just 4 touches for 20 yards, though that's 5 touches if you count the punch he threw to get himself ejected. 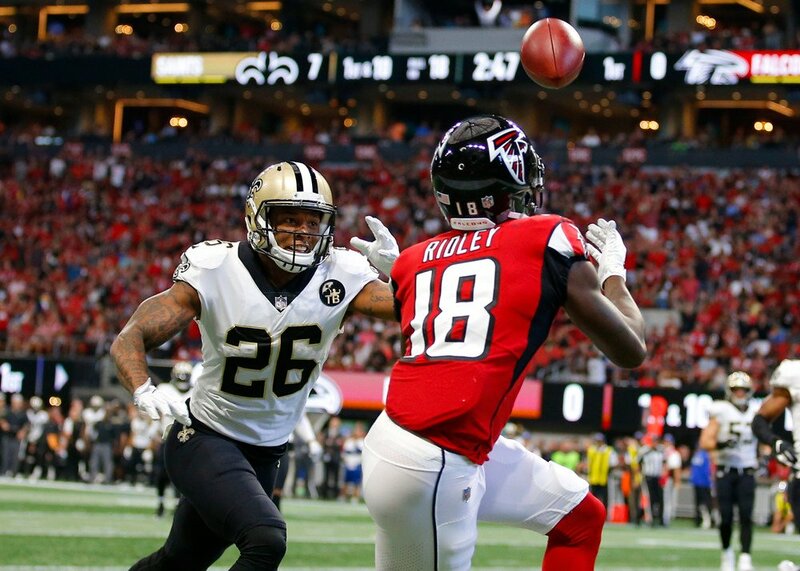 Rookie Calvin Ridley was the stud of the day with a monster game of 7 catches, 146 yards, and 3 TDs. Robert Woods also broke out with 10 catches for over a hundred yards and pair of scores. Little-used Jakeem Grant and Albert Wilson each had a pair of TDs for the Dolphins, while Jordy Nelson and Tyler Boyd each racked up over a hundred yards and a TD. Chargers Mike Williams had 81 yards and found the end zone twice. Larry Fitzgerald was a dud a second straight week with 2 catches for only 9 yards. Amari Cooper went invisible again with 2 for 17. Stefon Diggs was a bust like everyone else in Minnesota with only 17 yards on 10 targets. And every New England receiver was a miss, with all Patriots WRs combining for just 4 catches for 43 yards against a bad Lions defense. It was another quiet week for tight ends, but that didn't stop Travis Kelce from another big game. He had 8 catches for 114 yards. The top tight end of the day was rookie Dallas Goedert, who hooked up with fellow Dakotan Carson Wentz for 7 catches, 73 yards, and his first TD. Most tight ends were relative duds in Week 3. Evan Engram had only 1 catch for 19 yards and left injured. Hot waiver pickups Eric Ebron and Will Dissly busted too. Ebron had 33 yards and Dissly had just 1 catch for 4 yards.